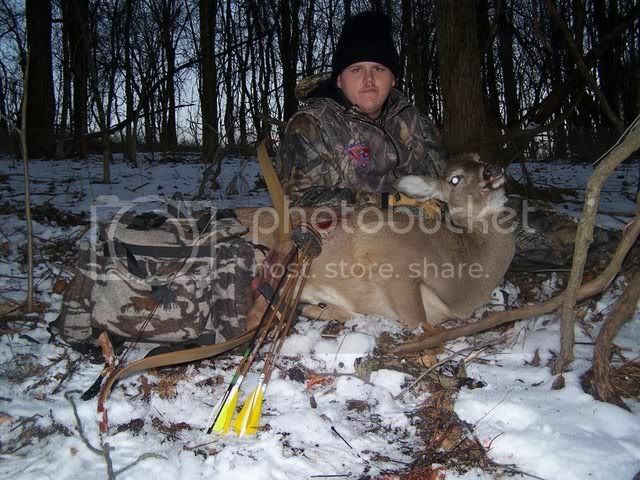 I took this doe(my first of the new year) on 1/26/07 while hunting on the ground. I shot her at about 10 yards with my zipper recurve and snuffer broadheads. The shot took out both lungs and she only went about 50-60 yards before piling up. My first deer ever in the snow with a bow! Your still Deer hunting in Ohio - Thats great. If you need snow, I have plenty at my house, also high tempertures in the teens. Guys, Thanks. Our archery deer season runs until Feb. 4th. "Earth has no sorrow which Heaven cannot heal...."
What a great doe! Taking it from the ground makes it even better. Nice job Chad,Looks like good eating to me. Love hunting in the snow. well well well ol Chad got one standing on the ground eh? Way to go buddy.